I’ve had the unique privilege of meeting some interesting individuals while working in the church. For whatever reason within the boundaries of the church people often feel free to express themselves in a manner not readily found elsewhere. Freedom to be yourself seems to be a rally cry. Isn’t it amazing that in a place that tries to make everyone look and act alike finds itself a breeding ground for individual expression. These people feel no need to muzzle or accept certain sociatial expectations. In many ways they behave like a cat that’s finally let out of the barn. What is so great about a community like the church is the acceptance shown to their own. (not always given to outsiders, unfortunately) Extreme personalities are often venerated and even taken as a source of pride. I imagine people comparing their church’s crazies with their friends crazies over coffee and donuts. The conversations must be so rich and fully bodied. There was an individual in a church I served named Desmond. He was a slight man who barely cast a shadow. One who almost disappeared in a crowd. But boy could he talk. He was an older man without inhibitions or limitations on his speech. Always good for a LENGTHY story that usually repeated the one previously told. Sometimes he would alter the facts a little which gave the listener a chance to focus. He was harmless and gentle but verbose to an extreme. One day Desmond came bursting into my existing conversation, as he was prone to do, to tell me his story. The story that got so much play was about his former occupation as a barber running what he affectionately called his “clip joint”. This day was no different. The crowd I was addressing parted to let the show begin. He continiously started the story in the same manner, “Reverend Fisher” When I…”, and off he went. I’ve never before nor ever since been addressed as Reverend Fisher, at least not with any sincerity. As he began I noticed something strange about Desmond. Something that just didn’t seem right, something was out of place. This is not easy to notice on a man who never took much concern on making his clothes even begin to match. But something was unusual and I just starred while he perseverated once again about cutting hair. Trying to be perpetually polite as ministers are trained to do, I couldn’t stop myself from noting the irregularity this day. I interrupted him in the middle of his usual story and asked him “Desmond, why do you have a q-tip sticking out of your ear”? He seemed dumbfounded as he reached towards his ear. “Oh, there it is, I was wondering what happened to it this morning.” With that he took the q-tip out of his ear stuck it in his mouth and wandered off. That day he never finished that story. 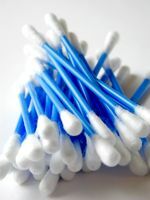 To this day I can’t help thinking of Desmond each time I see a q-tip. He’s forever cemented a memory within my mind I expect to never forget. Desmond was a meek, kind, and gentle man who had no malice in his personality. While his mind seemed to sometimes slip, his heart was pure and certainly worth remembering. Too often people like Desmond are just brushed aside as a nuisance. How many people have I ignored and found lacking because of the impression initially made. Too many I’m certain. What a shame! How many Desmond’s have I excluded from my life? How much richness have I missed and not ingrained into my heart from others? A book I enjoy reading states …by treating strangers kindly we have unknowingly entertained angels. I sure would like to be friends with more angels. You are quite the writer…Reverend Fisher!